I wish that I was more of a baker. Unfortunately, my baking past is littered with all kinds of baking misfortunes: lumpy cakes, leaden cakes, cracked cakes, dry cakes, lopsided cakes, burned cakes, burned cakes with runny centers, runny cakes with charred tops. The list is unfortunately long! I think it must be related to the fact that, when it comes to recipes, I am incorrigible: I rarely follow them to the letter. It doesn’t help that I am generally inclined to eyeball amounts instead of dirtying up another measuring cup or spoon. This is fine for regular cooking, but kind of disastrous when it comes to baking. So when I decided to try to come up with my own recipe for a polenta cake with mascarpone that would make use of the first of this season’s rhubarb, I was pretty nervous. Thankfully, it came out beautifully. The cake had a wonderfully moist and tangy crumb that beautifully complemented the rhubarb’s tartness. The idea of arranging the fruit (or vegetable? I guess rhubarb actually a vegetable) on the top of the cake batter comes from Nigel Slater’s Blueberry-Pear Cake from his Kitchen Diaries. One more thing: be sure to remove any leaves from your rhubarb stalks before cooking. Only the stems are edible. The leaves contain oxalic acid that can make you pretty sick. It goes without saying to keep your animals away from rhubarb. More for you, I say. What a delicious way to live dangerously! 1. Line the bottom of a 9-inch springform pan with parchment paper. Butter the sides. 2. In a medium-sized bowl, toss the rhubarb with 1/4 cup of brown sugar. Let the rhubarb sit for about 30 minutes. 3. Preheat the oven to 350°. 4. Sift the dry ingredients (the flour, the corn meal, the salt, the baking powder and the baking soda) together into a large bowl. 5. In another large bowl, cream together the remaining cup of brown sugar and the softened butter. Add the egg, followed by the mascarpone, the lemon zest and the lemon juice. Continue beating the mixture until it is nice and fluffy. Beat in the dry ingredients, a little bit at a time, until they are well-incorporated into the batter. 6. Spread the batter out as evenly as possible onto the bottom of the springform pan. It will be thick. Arrange the rhubarb by pressing each piece into the batter in concentric circles. Bake the cake for about 1 hour and 30 minutes, until the top is golden and the center has set. So impressed that this is your own recipe – it looks absolutely wonderful and sounds even better! Thank you, Frugal! I was so worried that maybe I put too much mascarpone in the cake and it wasn’t going to rise at all. Was so happy when it turned out! It did take 30 minutes more than I anticipated, but it was worth the wait. You are a brave woman. With baking, I am a total nerd—following recipes almost to the letter until I’ve made them a number of times. I’m just not enough of a scientist to figure out what might work on my own! This cake sounds great, by the way. Thanks! There was a lot of peering into the oven, thinking that I was going to have to chuck it. Especially after it went past the hour mark! I’m kind of like you too – sometimes I like to tweak recipes to suit what I have, and what I think I would like even better 🙂 My hubby on the other hand gets nervous when I do that!! 🙂 Yours turns out great and beautiful. I’m happy with how it turned out too. Sometimes when I tweak, I tweak too far, but if you don’t make mistakes, you never learn how to make it better! Thanks for the comment and thanks for dropping by! Wow, this looks amazing and so inventive. I’m super impressed. Aw, thanks! I had a scary moment when I thought there was too much cheese and butter, and not enough flour and eggs to hold it together. Luckily, it worked! What a gorgeous cake! It looks and sounds delicious. I am not a baker either but I will say that using a scale instead of measuring cups has helped me a lot, and speeded up the process to boot! I highly recommend finding recipes with weight measurements if you don’t like to wash dishes (and who does?). Thanks! I much prefer using a scale too. There was this blurb in Cook’s Illustrated about measuring cups. They measured out a cup of flour using different cups and the difference in weight between them was shocking. A cup of flour should weigh 5 ounces, and some cups were 4 ounces and others were more than 6! Mass over volume any day. Thanks! The cake turned out really well. I agree that baking can be much more punishing than cooking. I think that once you master the science, though, there is a lot of room for improvisation. I don’t think it will ever be to the point that I like it though, with a glug of wine in the pan and two glugs for me out of the bottle! I feel your baking pain – mind you I don’t see anything wrong with this one?! Thanks! I have seen your cakes though. You are a great baker! Yum – total win! And you use Meyer Lemons, which are my all-time faves. I have a tree groaning with almost ripe ones right now, so I’m going to file this away for a few more weeks. 😀 Hooray!!! You have a Meyer lemon tree? How incredibly lucky! That sounds like a complete dream! Do you ever squeeze them and freeze the juice when you have too many? I just love Meyer lemons. They are so fragrant and wonderful. One day, I will live somewhere I can grow Meyer lemon trees! Beautiful job! This cake sounds wonderful! I have a few ‘formulas’ committed to memory which I tweak as needed when I’m baking, but I find that my mood makes all the difference. If I’m cranky, I rarely bake well. Actually, I think the same rule carries over to cooking…. Thanks! I need to have a few formulas like that. 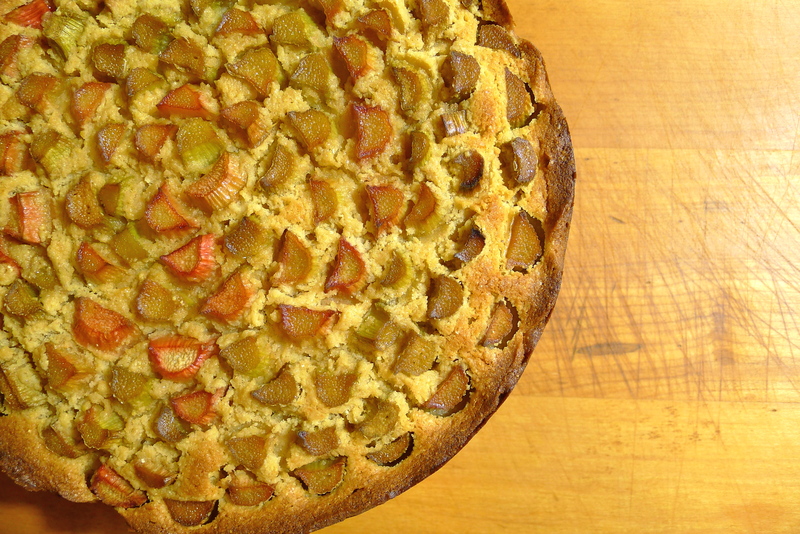 Usually, if I am going to bake something, it usually ends up being a tart. When it comes to cakes, I generally pop in in the oven and then realize that I forgot something important. Once I put something in the oven and realized that instead of 2 cups of flour and 4 eggs, I had mixed together 4 cups of flour and 2 eggs — which explained why it was like mixing concrete! “I can turn out a layer cake, but I need to use double the amount of frosting to stick the uneven layers together and completely spackle the outside” <–me too!! This looks gorgeous! I've only had rhubarb once, ever, in a pie baked by someone else's grandma in Minnesota. And it was so good. I don't think it really grows around here, though…. But I might have to keep an eye out for it anyway! Rhubarb is fantastic! Looks like celery but tastes like tart fruit. If you see some, grab it!